Forests represent the dominant terrestrial ecosystem on earth. They play an integral and irreplaceable role in our pursuit of sustainable development by providing a wide range of economic, environmental and social benefits. Forests are extremely important to Asia and Oceania where they supply diversified forest products (e.g. wood, fiber, non-timber forest products), contribute to soil protection, water purification, climate change mitigation, and biodiversity conservation, and provide many socio-cultural benefits (e.g. poverty alleviation, aesthetics, recreation, spiritual values). In this region and globally, efforts towards achieving the Sustainable Development Goals will have important implications for forests and they require a profound understanding of trade-offs and synergies, based on scientific evidence. These challenges and the role of research in addressing them have formed the foundation of the IUFRO Regional Congress for Asia and Oceania. The Asia and Oceania region is highly diverse in terms of social, economic and cultural contexts, distribution of forest resources, and the different roles that forests play. The region is undergoing dynamic changes that have important implications for sustainable development globally. At the same time the region faces a number of challenges, such as rapid urbanization, which is leading to declines in agriculture and forestry; unbalanced economies and resources contributing to illegal logging, deforestation and forest degradation; and climate change. These are all having serious negative impacts on forests, including increased forest fires and problems caused by pests and diseases. When decision- and policy-making are well-informed by scientific research findings, forests can play a crucial part in overcoming the challenges we face in the Asia-Oceania region as well as globally. And they can contribute to implementing the 2030 Agenda for Sustainable Development. 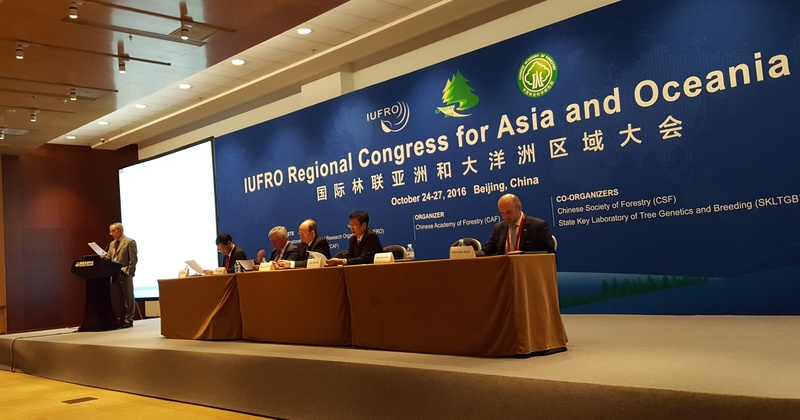 To this end, the IUFRO Regional Congress for Asia and Oceania 2016 themed “Forests for Sustainable Development: the Role of Research” was held from 24 – 27 October in Beijing, China. The congress brought together over 1,000 scientists, professional foresters and policy-makers from more than 60 countries. And it has explored the role of forest-related research in pursuing the Sustainable Development Goals in the region in a total of 90 scientific sessions, in which 530 oral presentations and 200 posters were presented. The congress has achieved a milestone both as the first IUFRO Regional Congress held in Asia and Oceania and the largest-scale Regional Congress in IUFRO’s 124-year history. Enhanced sub-regional, regional and international collaboration through forest-related scientific research, increased knowledge, experience sharing and communications. International partnerships in forest research are needed more than ever before in order to cope with the common challenges faced by the whole region, and to attain the Sustainable Development Goals. IUFRO, as the world’s network of forest science, will strive to deliver the enhanced research collaboration and synergy along with its organization and individual members.